'The Last Lear' is a hatke bollywood movie with interesting starcast of Preity Zinta, Amitabh Bachchan, Arjun Rampal, Shefali Shah and Divya Dutta. 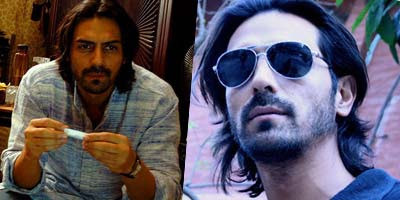 Arjun Rampal get long hair with bearded look for the movie. Cool dude is seen is glasses and with Amitabh Bachchan in the promotional shots. Hope he has something to do in the movie among big wigs around. Here is Arjun's first look from this movie.